Besides all those features, Beautiful Widgets now allows you to display independant Clock & Weather Widgets and you’ll enjoy a new 4×4 widgets (Clock and Weather Forecast information). Discover also our new eye-candy and friendly user interface, the new Theme Store and the Forecast Screen that allow to switch and add quickly new cities. You can see new weather information with the Hours Forecast. Don’t wait ! Purchase or update your version now on Google Play ! 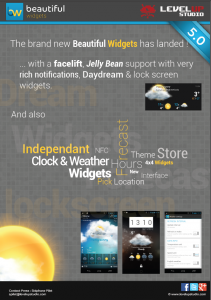 Pingback: Beautiful Widgets 5.0 disponibile sul Play Store | Notizie, guide e news quotidiane!